This article will provide guidance on the correct procedure when carrying out insulation resistance testing where USB socket-outlets have been fitted. 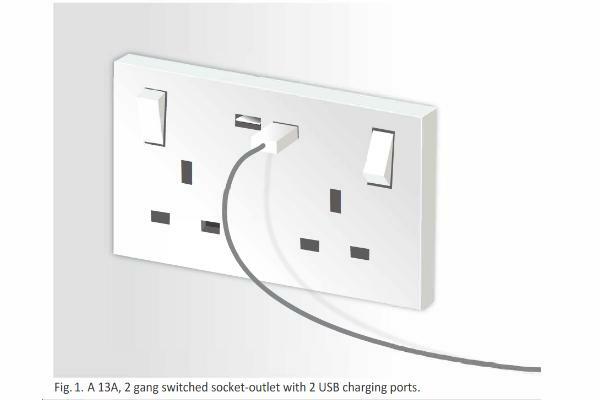 The increasingly common sight of 13A socket-outlets with USB* charger ports in domestic and other premises should come as no surprise given that, for many of us, charging up mobile phones and tablets is now part of our daily routine (Fig. 1). However, the presence of USB socket-outlets has given rise to some concerns about the effect of these accessories on test measurements when insulation resistance (IR) testing is carried out. Socket-outlets with integral USB charger ports came onto the market in 2013 as an alternative to plug-in chargers, a number of which were shown to have serious safety defects. Self-contained USB charging modules are also available but socket-outlets with integral USB ports have proven especially popular since they can replace existing socket-outlets, thus removing the need for additional wiring. Safety concerns have been raised about socket-outlets with integral USB charger ports. Previously, they were not covered by a single product standard but the introduction of BS 1363:2016 has changed that. Socket-outlets with USB charger ports are now included in BS 1363-2:2016, Specification for 13A switched and unswitched socket-outlets. The inclusion of these accessories in this standard brings them into line with BS 7671 which states that every socket-outlet for household and similar use should preferably be of a type complying with BS 1363 (see Regulation 553.1.201). See also Regulation 559.5.1(v) concerning connections to the fixed wiring and Regulation 433.1.204 regarding ring final circuits. Most socket-outlets with integral USB charging ports can fit into a standard 35mm back box but some types require a 47mm back box. Before discussing IR testing, it will be helpful to consider how USB charger ports operate. Battery-powered devices which are charged from USB charger ports normally require a supply of 5 Volts d.c.. A maximum charging capacity of up to around 3 A can be drawn from one port. Where a socket-outlet has two USB ports, both ports can be used simultaneously, with the 3 A charging current being split between both ports. This means it may take longer to charge up each device. To convert the nominal mains voltage of 230 V a.c. to 5V d.c. requires both reduction and rectification of the mains voltage and this is achieved efficiently using a switch mode power supply (SMPS), which utilises a semiconductor switching technique. The SMPS is normally connected across the line and neutral terminals and has a resistance of approximately 0.2 MΩ. Consequently, an insulation resistance (IR) test carried out between the line and neutral terminals will detect this resistance and the reading obtained will be distorted. It should be noted that the electronic circuitry in an SMPS can be damaged by a 500 V IR test between line and neutral terminals and the USB port may fail to function following such a test. Regulation 612.3.2 requires that any device or equipment which is likely to influence the result of an IR test, or be damaged by such a test, must be disconnected before the test is carried out. Disconnection may be viable where there are only a small number of socket-outlets with USB charger ports in the final circuit(s) to be tested. However, it becomes less viable as the number of these socket-outlets increases because disconnection (and reconnection) is time-consuming and introduces the possibility of the socket-outlets being wrongly reconnected. In such circumstances, the tester may well conclude that it is not reasonably practicable to disconnect the socket-outlets. 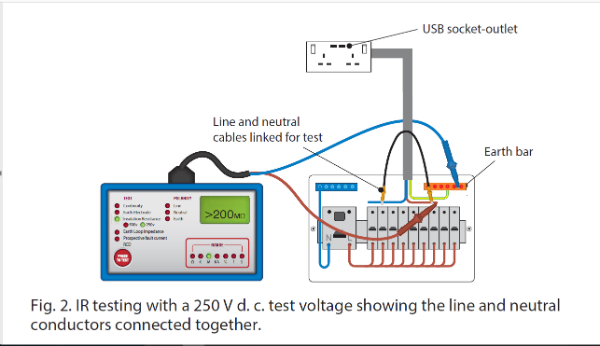 Reduce the test voltage to 250V d.c.
Regulation 612.3.2 gives an alternative course of action where it is not reasonably practicable to disconnect vulnerable equipment, such as socket-outlets with USB charger ports. In such cases, the test voltage for the particular circuit may be reduced to 250V d.c. but the minimum insulation resistance value of Table 61, ie. 1 MΩ, still applies. A third option is given by Regulation 612.3.3. Where an IR testing is carried out using a 500V d.c. test voltage, the live conductors (ie. line and neutral) must be connected together for the duration of the test and a measurement taken between the line/neutral connection and Earth. This connection could be conveniently made at the consumer unit without having to disconnect the socket-outlets (Fig. 2). It would also be acceptable to use a 500V d.c. test voltage to measure between line and Earth, and neutral and Earth separately. However, the note to Regulation 612.3.3 advises caution and states that additional precautions, such as disconnection, may be necessary. There is a distinct disadvantage in not testing between live conductors as a line to neutral fault would not be detected. Such a fault could result in the operation of the protective device or, in the worst case, a fire. On the other hand, short- circuit faults can usually be identified by a reading which is significantly less than the normal internal impedance of an SMPS (around 0.2 MΩ). The installation of electrical equipment, such as USB socket-outlets, must take account of manufacturers’ instructions (Regulations 134.1.1 and 510.3). It is important that the instructions of the manufacturer regarding the use of the USB ports are passed on to customers. This information can then, in turn, be conveyed to any electricians carrying out future works in the property. With the above considerations in mind, NAPIT recommends that IR tests on final circuits incorporating socket-outlets with USB charger ports should ideally be carried out with a test voltage of 250V for new installations and additions/alterations to existing installations. When carrying out a periodic inspection and testing on final circuits containing socket-outlets with USB charger ports, a limitation on IR testing of such circuits could be considered. *USB means, ‘Universal Serial Bus’, which is computer jargon referring to an industry standard for digital data communications.